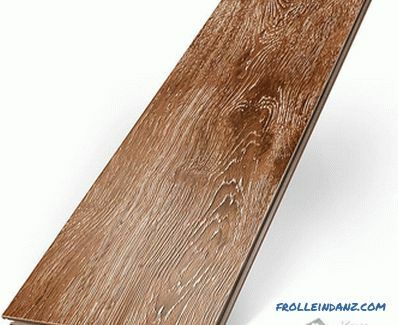 Laminate flooring is very popular for laying on the floor in residential and office buildings. And all thanks to the excellent aesthetic perception, ease of installation and quite excellent performance characteristics. If the floor surface is flat, then lay the laminate in this case on their own easier than simple. Knowing a few secrets in this area, laying the laminate on the concrete floor with your own hands will be simple and pleasant. Laminate is available in the form of panels, the length of which can vary from one to one and a half meters. The thickness of the panels is from 7 to 13 mm, and width up to 300 mm. Laminated floor panel consists of several glued layers, each of which performs a specific function. One layer plays the role of the basis, the other layer protects from various influences, the third, topmost, performs a decorative function. Modern laminate has very good strength characteristics. And all thanks to the use of modern components, which give it greater strength. The top layer in the form of a film plays a particularly important role, because it will be the main mechanical loads, the effects of moisture, ultraviolet and much more. Under the transparent protective film there is a texture, looking at which we choose laminate, painting in our imagination how it will look in the interior. 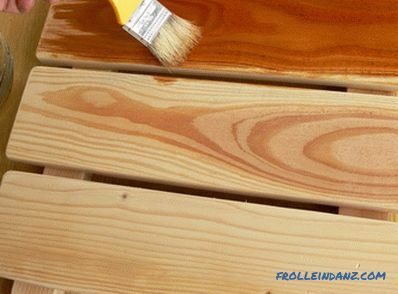 Usually laminate repeats the texture of wood, but there are other options. Modern high-tech laminate is also stabilized. This process is the complete removal of moisture and air bubbles from the material using a vacuum. After that, the smallest pores are filled with a special composite substance. Such a laminate perfectly resists any fluids and high humidity. 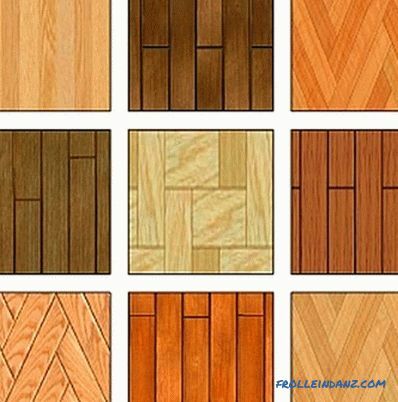 By the way of joining there are several types of laminate . It can be glue, shunt or with a click lock system. The first option today is almost never used. 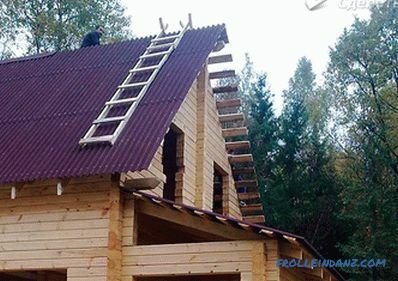 Due to the use of glue during installation, a non-separable structure was obtained. 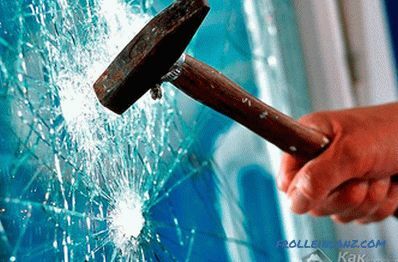 If you need to replace the damaged area, or repair, glued panels are very difficult to disassemble. Unlike the previous one, a click system is much more convenient. Here, an end lock is used, which allows the panels to be fixed and securely connected to each other. You need to insert the next panel into the groove of the previous one at an angle of 30‒35 degrees and lay it on the floor. There is a snap and secure fixation of the panels. If necessary, the system allows you to assemble and disassemble panels without damaging the locks. 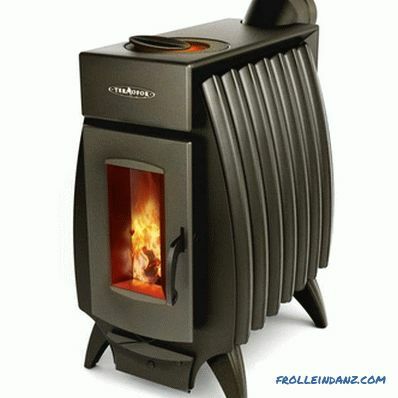 This is very convenient, since the installation is a simple job available to anyone. Another type of laminate is shunt. He is the most common. The connection is made by inserting the connecting rib into the grooves of the previous panel. This is achieved by lightly tapping the end of the panel until the gap is completely eliminated. Tapping is done only delicately and only using a soft lining, otherwise you can simply chop the edges of the laminate board. 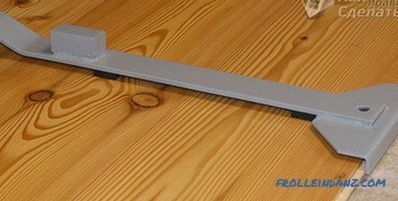 The connection is not as effective as the "lock" system, frequent assembly and disassembly can disable the lock, and the panel will become unusable. The reliability of laying and use of laminated coatings depends on the quality of the concrete base and how well it is leveled. The surface must be strictly horizontal, dry, have a waterproofing. If you are going to lay laminate on an old concrete base, then before that you need to evaluate its quality. If there is a height difference of more than 2 mm per m 2 , then it is necessary to eliminate all irregularities. In case of failure to remove flaws with putty and sanding, a new screed is necessary. 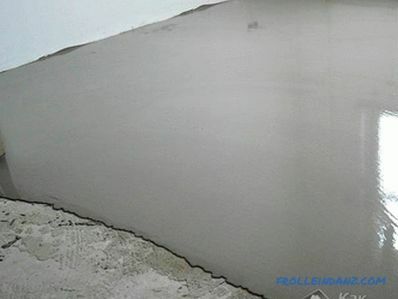 Here, manufacturers offer a lot of options from ordinary cement mortars to self-leveling quick-hardening floors. Even if the instruction states that the floor dries completely within a few hours, it is better to wait a few days with laying the laminate and let the excess moisture completely leave the new screed. Otherwise, non-evaporated moisture will begin to be absorbed into the laminate. This can lead to sad consequences for covering - a fungus and mold will start to form. Before laying the laminate on a concrete floor, you must ensure reliable waterproofing of the base. This should be done, since the laminate from the inside is very sensitive to the appearance of moisture. She absorbs her backside like a sponge. The most unfortunate method of waterproofing is the usual cellophane film. It does not provide adequate protection. There is no need to save, use a special substrate, such as polystyrene foam. The function of waterproofing can be performed by a foam polyethylene substrate. First, what is recommended to do is to put the laminate for a few days to acclimatize in the room where it is planned to be laid. This will save you from possible problems in the future. It must be remembered that the laminate is laid with a mandatory gap of 10 mm from the walls. 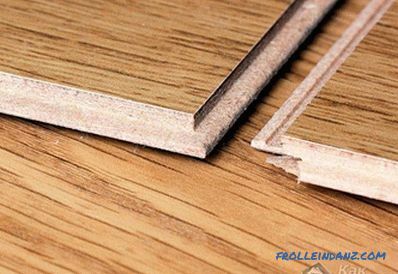 The required clearance is provided by an insert between the wall and the wedge laminate panel. Laying laminate should be done in such a way that the panels are located as far as possible along the light flux. Now you can proceed to laying the first row along the wall. After the row is completed, the sawed part of the panel will remain. From it begin the second row, and so on. This approach allows minimization of waste during laying. In addition, it provides a constant displacement of the joints, which is very important for the strength of the coating. 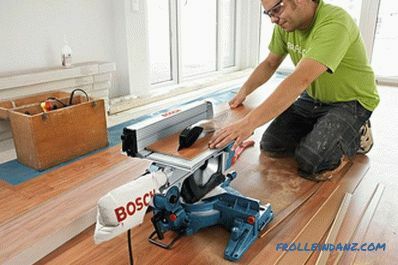 There are several more types of laying laminate boards. For example, the so-called "brick". The panels are arranged as in a classic brick wall. However, in this case the amount of laminate increases. This method is used quite rarely, as it is necessary to additionally buy up to 20% more laminate. And this will agree for many expensive. In this uncomplicated manner, laying of the floor on any floor occurs. The last row, if necessary, cut along, taking into account the 10 mm gap. If you follow all these rules, you should get a beautiful, smooth surface, pleasing the eye. For greater clarity, we recommend to watch the training video.